The match took place in a blustery wind - with the main stand protecting the pitch lower down and with the wind blowing from one side of the pitch. Despite the wind, the Woking fans behind the goal were very audible in a crowd of just 807. Changes to the Woking team included Christian Jolley (picture) coming into midfield and Jake Hyde coming back to lead the attack while Greg Luer dropped out of the squad. Reise Allassani started on the bench. Welling started the match three places below Woking and 12 points behind, but with ambitions, of course. to stay in contention for the play-offs. Woking were the better team for the first 20 minutes - apart from the two goals that Welling scored! The Cards fought their way back to 2-1 at half time and looked to have the momentum. However, in the second half, Welling extended their lead to 3-1. It looked as though it was going to be a defeat for Woking, but two goals from substitute, Allassani, saw the Cardinals win a deserved point in an incident packed game that saw six goals and six bookings. The game was competitive but was played in a good spirit and was excellent entertainment with several goals of the highest quality. Woking started well with lots of quick and sharp passes and in the second minute, a cross from Kretzschmar almost got to Hodges at the far post. Early on, it was clear that one of the key battles would be between the short, but speedy Welling attackers who barely came to the shoulders of Collier, Gerring and Diarra. The Cards were dominating possession and a move by Little, Casey and Kretzschmar led to a dangerous cross that was just too close to the keeper. At seven minutes, Welling had still had no possession in the Woking third of the pitch. In the ninth minute, Armani Little went down with an injury after a tackle, but was able to carry on. Just after he came back on, he was booked for a late challenge and Woking conceded a corner - the first possession that Welling had had in the Woking third of the pitch. A corner to Welling in the fifteenth minute saw a strong header into the far corner of the net after a corner by McCallum (who played for Woking) and Thierry Audel rose above the Woking defence. Ross had no chance of stopping the goal. Within three minutes, a good ball to Kiernan on the right wing saw him go past Casey and cut the ball back for another great volley from Audel and an eye-catching goal into the opposite side of the goal. Again Ross had no chance. That was 2-0 to Welling, despite the territorial advantage of Woking. Cards fans were really nervous as another dangerous break threatened, but the attack was well defended by Durojaiye. Woking then got a foothold in the match as a passing move down the left wing involving Casey, Kretzschmar and Little saw Casey surge into the box and get a cross over that was turned in by Jolley to reduce the deficit to 2-1 - after three goals in six minutes. The goal revitalised Woking and an attack by Hodges and Little on the right looked threatening, but Little's cross went just over the bar. It was end to end for most of the rest of the half. However on 43 minutes, Kiernan again got the ball to Goldberg who put Welling further ahead by firing a shot into the top corner. That meant that Woking went in at half time down 3-1. Woking really hadn't threatened enough, with too many shots close to the keeper although Hyde was proving quite effective with his back to the goal. He looked very dangerous at one point as he swivelled well, but he couldn't get a strong shot away. Welling didn't sit back and the first notes I had for the second half were all about Welling chances. They were pressing well and still threatening. On 55 minutes, Little's injury from the first half seemed to have got the better of him and he came off, to be replaced by Harvey Bradbury who added a physical presence further forward. Hodges was fouled on the right hand side and the resulting free kick looked as though it might threaten, but was well defended by Welling. Bradbury was held and won a free kick around twenty five yards out and the ball was put in a great place to evade the keeper by Kretzschmar, but there was nobody on the far post to convert it. At this point, neither side was dominating but Woking had a couple of chances. Bradbury was working hard to pressurise the Welling defence, but a bit too much pressure on Wilks, the Welling keeper, saw a bit of a 'melee' in the goalmouth and a booking for him and for Josh Hill who got involved. "Worldie" was the word of the moment in the press box and at 3-2 it was going to be 'game on' for the rest of the match. Woking again seemed to believe they could get something although Welling were not sitting back and continued to press well to put Woking's defence under pressure whenever they could. At one point there was a dangerous attack by Welling, but Mendy and Goldberg got in each other's way and the ball was cleared for a corner. It was end to end after that and a long ball to Bradbury saw him get a good header down but there was nobody there for the Cards to exploit the half chance. Allassani was cynically brought down by Kiernan who was booked in the 88th minute - the fourth Welling player to go into the book in the second half. A flowing attack by Woking saw Hyde get the ball to Bradbury on the right hand side and he got his cross in for Allassani to put into the net - bringing the game to 3-3 at 90 minutes. 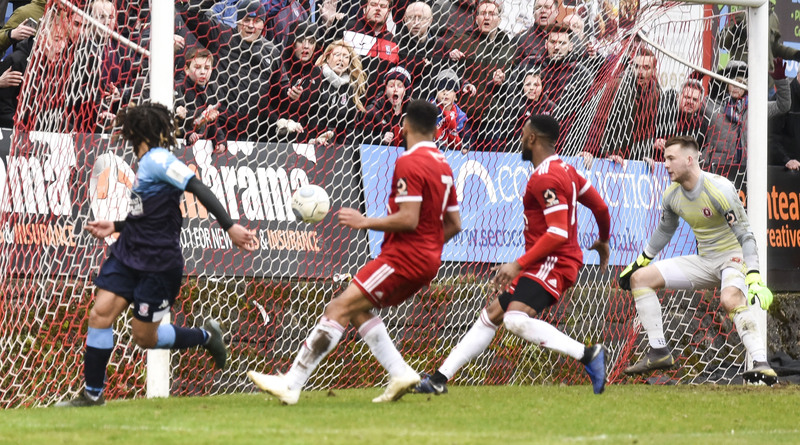 In the six minutes of added time, there were chances by both sides, but Welling had one weak shot and in another hit the ball straight at Ross. Woking thought they could get something when the ball bobbled around in the Welling penalty area after a free kick to Woking, but Bradbury's athletic shot was wide and weak and so the game ended at 3-3 with fans feeling that it was, in the end, a point gained, rather than two lost. In the final analysis, the teams both attacked well at times, but were inconsistent in defence. Having said that, there were four really good goals and a lot of entertaining football for fans to enjoy. Had Woking managed to score as they did at Oxford the other evening, it would have been very harsh on Welling who showed their skill and never sat back even when well ahead. Man of the Match: Reise Allassani – an easy choice. If I had needed to choose at half time, it would have been difficult as there were few outstanding performances, but Armani Little played quite well.